Like Dracula in charge of the bloodbank, we at OtherFilm are overjoyed to be let loose at the National Film and Sound Archive next week, in preparation for a *very* special event. We’ve discovered a rich vein of cine-matter, and we’d like to share it with you. We’re planning a breathtaking evening of live, installed & multiscreen performances featuring some of the most tempting treats of the international expanded cinema, to be experienced for one night only, in our nation’s gracious capital. From London, from New York, from Sydney and even Brisbane, there will be experimental projections in all directions, happening throughout and all about the hallowed halls of the Archive. With crazy multiscreen, psycho-active flicker and an Australian Film Revival-era documentary surprise – all projected on beautiful celluloid film – it is set be historic (and maybe even a little hysteric). We’re shivering in anticipation of the thrills in store for us, and for you. May we present The International Expanded Cinema Extravaganza - a feast for your senses, and ours. All films from the historical program are shown on 16mm, prints courtesy of the National Film and Sound Archive, and courtesy of the artists. 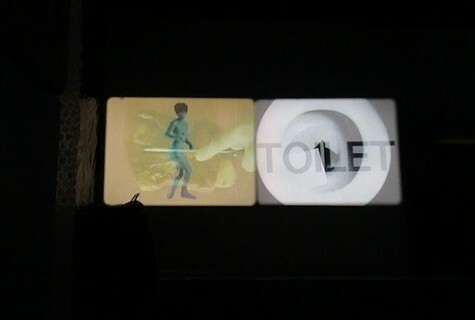 All videos in the contemporary program are presented in digital formats, courtesy of the artists. David Perry and Albie Thoms, 1965, 1 min, Digibeta [originally 16mm] A very early example of performed film in Australia, by the trailblazing Ubu collective, featuring the titular poem by dada master Kurt Schwitters, nonsense, and lots of shouting.